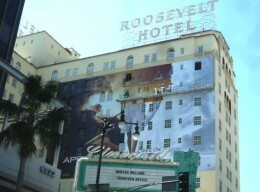 "Clash of the Titans" supergraphic being installed on east wall of hotel. A company accused of maintaining illegal supergraphic signs on the Hollywood Roosevelt Hotel the past four years is seeking millions in damages, claiming that enforcement efforts by the city of L.A. have made it impossible to guarantee advertisers continuous coverage on the walls of the iconic Hollywood Blvd. building. Marc Caldera, of In Plain Sight Media, testified in a federal court deposition that the company lost an average of $80,000 a month each for the east and west-facing walls of the building, for varying periods of time from 2007 to the end of last year. The potential revenue just one year, he testified, adds up to more than $1.9 million. The saga of the supergraphic signs, most of which have been for the Swedish clothing company, H&M, began in 2006 when In Plain Site Media applied for permits under a provision of the Hollywood redevelopment area allowing temporary supergraphics for up to 120 days to advertise movies and other Hollywood-oriented events. But the city’s Community Redevelopment Agency (CRA), which had jurisdiction, refused to sign off on permits, saying that the hotel didn’t qualify under the provision as an entertainment-oriented venue. The company put up the signs anyway, and went to court when the city issued an order to remove them. In June, 2007, a judge issued a temporary restraining order against the city, and in August of that year the city issued permits for two temporary supergraphic signs. Three months later, the CRA, which had been sued by other companies over the temporary sign provision, decided to repeal it. And in November, the city issued another citation against In Plain Sight Media and the Hollywood Roosevelt Hotel. That citation was appealed, but was rejected by the city’s Board of Building and Safety Commissioners. In 2008, the company applied for permits under provisions of the city’s general sign ordinance for two temporary signs totaling 14,000 sq. ft. on the east and west faces of the building. Because the hotel is listed as a cultural-historic landmark, no permits could be issued without a signoff from the city’s office of Historic Resources, and that permission was denied on the grounds that the signs would be incompatible with the hotel’s historic qualities. That didn’t deter the sign company, however, which once again put up a huge sign for H&M clothing on the east wall. Once again the city issued a citations, including one in April, 2009, from the fire department that called the sign unsafe for reasons including, “increased flame/fire/heat spread; degraded melting/burning debris; obstruction and hampering of first responder operations.” Shortly thereafter, the sign company and hotel filed a federal lawsuit against the city, claiming a violation of rights under the 1st and 14th amendments of the U.S. Constitution, and in response the city filed a counterclaim, seeking a fine of $2,500 a day for the time the sign has been illegally installed on the hotel. The latest motion, seeking damages from the city for interfering with its use of the hotel walls for advertising, was filed last month in that federal court proceeding.